Corner Tracks are made out of wear resistant UHMWPE material, We manufacture Magnetic Corner Tracks. We can offer tracks in various center radius. 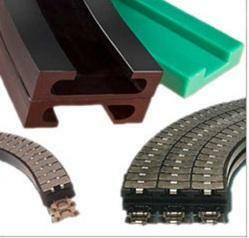 Corner and Straight track are designed to work with flat-top conveyor chain. Our UHMWPE Corner Tracks are cost-effective, chemical resistant, and suited for dry or wet applications. Tab type corner tracks or corner bends helps in design simplification of the conveying system. These corner tracks eliminates the requirement of two conveyor transfer system, which proves to be expensive. The tracks are made using graded UHMWPE, which helps in providing a wear resistant and frictionless surface. Looking for Corner Tracks ?